Protecting your place of business or your home can be done with the help of a poly tarp. The poly tarps are indispensable for protection from the elements and to keep items from scattering. They are helpful in covering the contents of a pickup truck should you find yourself hauling a load to the local dump. If you have limited storage space you can use a poly tarp to cover your garden tools or furniture without moving them from the outdoors. They provide rain or sun protection. Made from canvas or plastic it is a versatile tool to have. The poly tarp is made from polyethylene or polypropylene. It is waterproof and made from two or more sheets of plastic with a woven layer in between. The poly tarps are great for protecting delicate garden plants when they are young or if they are prone to freezing or burning when the temperatures drop in the winter. A poly tarp can protect your home in the event of a leak in the roof and can last for about three months until a repair is made. They come in many different weights to accommodate whatever situation you encounter. Super heavy duty to medium thicknesses are available. For a short term remedy a medium thickness would suffice in most situations. If you require a longer time frame to cover an item then you should look at using a super or heavy duty weight to withstand the weather conditions. A poly tarp makes a good covers for vehicles to protect them from dust and the elements. They are great for use in the garden or for protecting garden machinery like a lawn mower or edger. They come in a variety of colors and sizes, strengths and weights depending on what sort of application you will need to use them for. The tarp is one item you should not be without. We are using a poly tarp for the same reasons. 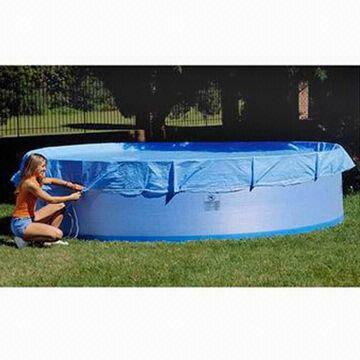 Our pool needing covering so we got one of your round poly tarps.